One of the most majestic parts of vacationing near the beach is being able to see the sunrise over the horizon, as it unleashes its colors upon the morning sky. And although it doesn't set over the ocean, the sunrise is something truly special to behold as well. In Myrtle Beach, there are plenty of places to take advantage of this picturesque view. Here are our Top 5 Places to Watch the sunrise or sunset in the Myrtle Beach area. Get there early and let the beautiful sights take your breath away! 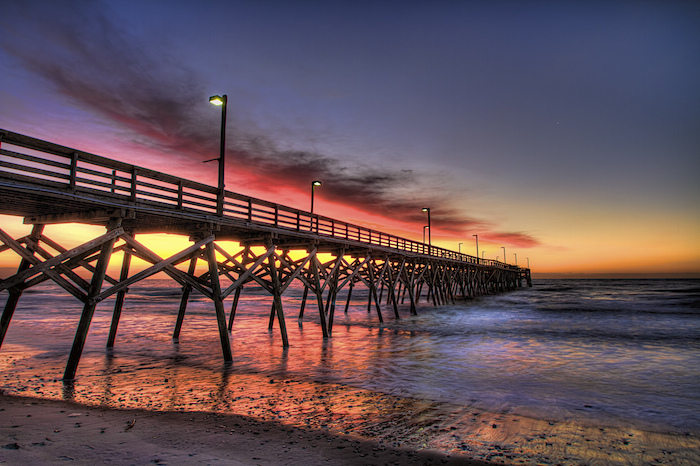 The 2nd Avenue Pier is located at 110 North Ocean Boulevard in Myrtle Beach and opens every morning at 7 a.m. Situated on the South side of the Boardwalk, 2nd Avenue Pier offers up fishing, dining, and sightseeing for visitors. You'll be out on the ocean as you watch the sunrise from this fabulous locale. If you're on the North end of the Grand Strand, head up to Cherry Grove Pier for a lovely morning with the sun. This pier opens to the public at 6 a.m., so you'll have plenty of time to get your cameras and breakfast picnic ready before the sun comes up! For an outstanding view of nature like no other, stop by the Murrels Inlet MarshWalk before sunset when you're on the South end of the Grand Strand. The stretch of shopping and dining establishments scattered along this route have a beautiful backdrop of the most vivid pinks, oranges, and purples that you can find anywhere. The reflections on the inlet waters make for a romantic and charming end to a hot, summer day in Murrels Inlet. If you're visiting Myrtle Beach on vacation, it's very likely that you will visit the Boardwalk area at some point during your stay. Located in the heart of Downtown Myrtle Beach, this area has been known for decades as a hotspot for tourists and locals alike. With its thoughtful landscaping, scattered Palmetto Trees, and open view of the coast, the Boardwalk area is perfect for early morning sunrises or even sunsets. The sky's hues will melt before your eyes, as you start off or end your beach day. The SkyWheel is one of Myrtle Beach's premier oceanfront attractions, and it offers the perfect viewing location for the Atlantic Ocean. Since it doesn't open until 11 a.m., you won't be able to view the sunrise aboard this enormous ferris wheel, but it stays open late, making it the perfect place to experience the sunset. Climb aboard as you're taken 187 feet into the air on one of the SkyWheel's special "flights." You can see for miles down the coast when you take part in this thrilling adventure. Make it even more special when you partake in a flight around sunset and see how the colors of the beach come to life. What's better than waking up and having a morning coffee from your own private balcony, overlooking the Atlantic Ocean? 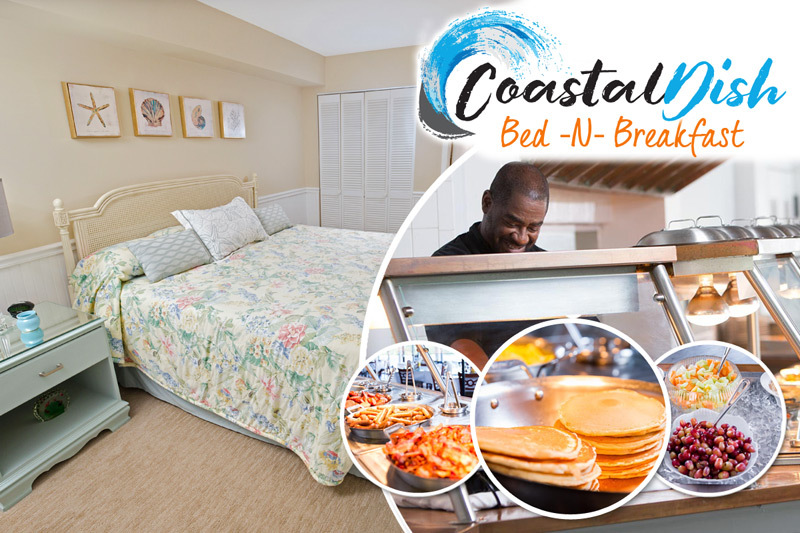 In the comfort and privacy of your own Myrtle Beach condo rental, you can experience the glorious South Carolina sunrise as it shimmers over the water and up higher above the horizon. Keep your eyes peeled for fins popping out of the waves, as guests sometimes report seeing dolphins frolicking in the early morning. Enjoy the sunrise in relaxed seclusion when you watch it from your balcony. Make sure you are able to witness one of Myrtle Beach's gorgeous sunrises or sunsets during your beach vacation. Maybe you can even make the day extra special by experiencing both!